Pair of Edradour Whisky Nosing Tasting Glass (Glencairn glass). Condition is Used but lovely condition no chips as seen in photos happy to answer any questions and when I send I’ll make sure they are well padded and protected Dispatched with Royal Mail 2nd Class. Vintage Brass Tankard. Condition is Used. Dispatched with Royal Mail 2nd Class. New listingSmall decorated tankard (1614) approximately 22cms (81/2 in hes high. Small decorated tankard (1614) approximately 22cms (81/2 in hes high. . Condition is Used. Dispatched with Royal Mail 2nd Class. THIS HUGE QUART (2 PINTS) PEWTER TANKARD IS VICTORIAN OR EARLIER AND IS MADE WITH THE MAIN BODY BEING A TAPERING CYLINDRICAL SHAPE WITH DECORATIONS TOWARDS THE BASE. THE TANKARD IS MARKED ON THE INSIDE WITH A CROWN AND AN 'X' AND AN 'M', THE CROWN BEING A SIGN THAT IT IS QUALITY MADE PEWTER. IT IS A ONE PINT TANKARD THAT HAS BEEN BOTH MADE AND HALLMARKED IN BIRMINGHAMS JEWELLERY QUARTER. THE DESIGN IS A CLASSIC GEORGIAN SHAPE AND THE TANKARD HAS A SOLID CAST HANDLE WHICH IS DIFFERENT TO MOST THAT YOU WILL SEE THAT HAVE HOLLOW HANDLES THAT ARE STAMPED IN TWO HALVES. Dads Army ceramic beer stein. Features the slogan 'Don't Panic!'. Cosmic Gifts have been established for over 25 years. Providing new and unique gift solutions for any event. The perfect gift for Dad. 9.2cm tall x 11.5cm including handle. All faults are clearly described. Our policy is to standardise as much as possible. Weight - 243g. OLDE COUNTRY ROSE PEWTER TANKARD GLASS BOTTOM POIGNANT "THE LAST DROP"
Stands at 5" tall, 4" wide base and weighs 390g. In good unpolished condition. DOUBLE DIAMOND 1/2 PT CROWN STAMP BEER GLASSES Pair x2 Retro Rare . Condition is Used. Dispatched with Royal Mail 2nd Class. 6 Vintage Cricket Club Minature Glass Tankards. 6 Vintage Cricket Club Minature Glass Tankards. Vintage County Cricket memorabilia from Gloucetershire C.C.C. Lords Cricket Ground. Nottinghamshire C.C.C. Sussex C.C.C. Warwickshire C.C.C. Worcestershire C.C.C.. The tankards are 7cm tall. All have the word 'France' on the bottom. The items probably date from the 1960's. 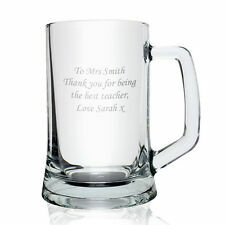 Personalised Engraved Pint Beer Glass Tankard Wedding Usher Father of Bride Gift. Heavy Base Stern Tankard. Personalised with up to 7 lines free. Collectors Batman Glass Tankard - Small. Condition is New. Dispatched with Royal Mail 2nd Class. Pottery tankard with repeated design of man and woman in (Austrian?). A heavy 2 pint Holsten Export glass tankard from Austria. Approx 20cm tall. Plastic freezer football club tankard. Holds 16 oz or 454 ml. Not dishwasher or microwave safe. WE ONLY CAN FIX A PROBLEM IF YOU LET US KNOW. 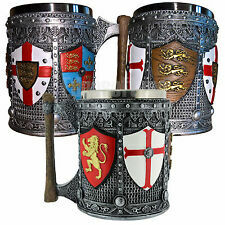 Rutland English Pewter Tankard 1 Pint " FREE ENGRAVING"
Made in Sheffield EnGland. (To David with Love from Mum and Dad). Stamped on the base "Made in Sheffield England English Pewter". Interesting Handle in the shape of a fish. 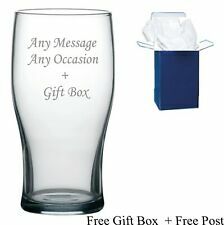 Personalised Engraved Pint Glass. Capacity: 20oz (Pint) 600ml.